6 Sachets of Oral Electrolyte Powder. 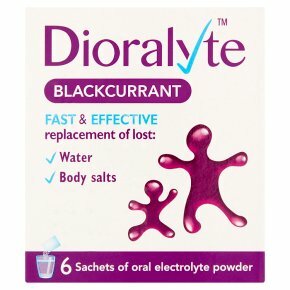 How to Use Dioralyte: Dissolve contents of one Dioralyte sachet in 200ml (approx. 7 fl oz) of drinking water. Use fresh drinking water for adults and children. For infants, and where drinking water in unavailable, the water should be freshly boiled then cooled. The solution should be made up immediately before use. If refrigerated the solution may be stored for up to 24 hours, otherwise any solution remaining one hour after reconstitution should be discarded. Dioralyte should only be reconstituted with water and to the volume stated. A lesser or greater dilution may result in electrolyte imbalance. Dose: - unless prescribed otherwise by your doctor. Adults (including elderly): One or two sachets after every loose motion (each sachet dissolved in 200mls of water). Children: One sachet after every loose motion. Infants up to the age of 2: One to one and a half times the normal 24 hour feed volume using Dioralyte solution prepared as directed above. If the illness is not improving within 24-48 hours consult your doctor. When vomiting is present with the diarrhoea, it is recommended that small amounts be taken frequently. PRECAUTIONS: If you are suffering from intestinal obstruction, diabetes, kidney or liver failure, or are on a low potassium or sodium diet, ask your doctor or pharmacist before using Dioralyte.<br>Infants under the age of 2 years with diarrhoea should be seen by a physician as soon as possible.<br><br>Keep all medicine safely away from children.